That’s something I’ve learned and leaned on as I’ve gotten older. Two of my best friends had babies nine months ago, and every time my friends talk to their little ones about me, they refer to me as “Auntie Jenn.” I’m not related to them by blood, but when you’ve been friends for seven years and have gone through ups and downs together, you’re bonded. A Million Little Things is as much a show about friendship as it is about family. In fact, I think that the show has already argued that friends are family too. In “band of dads,” we get to witness this firsthand — with Jon’s death still fresh on everyone’s minds, our main men decide to step up and be there for Sophie and Danny. But with Gary, Eddie, and Rome each facing their own issues, it isn’t a smooth ride. 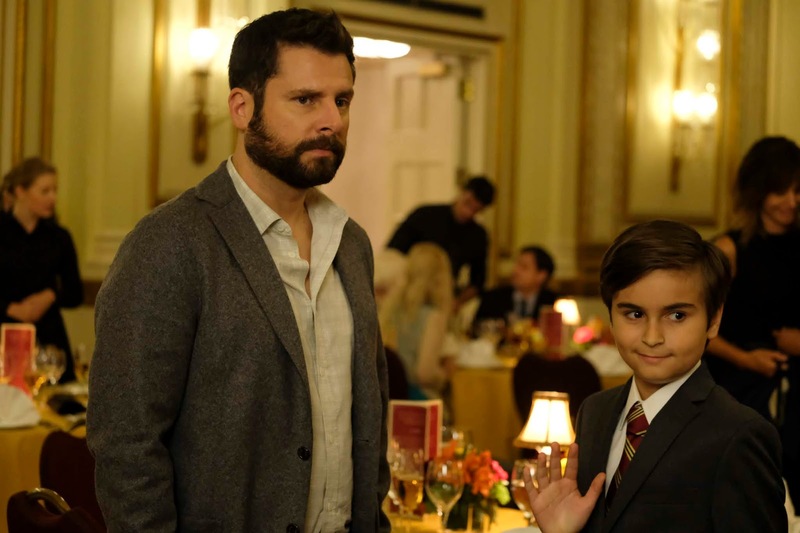 I feel like every episode review will contain some variation of: “James Roday is incredibly talented,” so prepare yourselves now. The thing about Roday is that he’s able to absolutely nail dry, sarcastic humor and balance it with deep, moving moments with relative ease. Gary is the kind of guy who’s a bit of a mess, and he’s okay with it. (He’s got four French fries and a single roll of paper towels in his car, after all.) But the one thing that’s important we know about Gary? He still shows up. Always. In “band of dads,” we get to watch Gary and Maggie’s relationship unfurl a little bit more. Maggie, it turns out, is harboring a bit of a secret from her new bed buddy — she’s technically separated from her husband. Or maybe not legally separated, even. All we know is that she ran away from him because she couldn’t be what he needed her to be. But as Gary tries to be okay with the casual nature of their relationship, you can tell the secrecy bothers him. For all his deflection — and he’s very good at it — Gary is actually a big teddy bear. He has a great, compassionate heart for his friends. He’s the only one following up with Rome to make sure he’s okay. He’s also the only one who notices when Danny lies. In an incredibly moving scene, Gary listens as Danny half-confesses that he has a crush on a boy in his grade. Danny worries that his dad might have taken his life because he knew. Gary gently and passionately reassures Danny that Jon loved him very, very much and that knowing this secret would have only made Jon love him more — just like Gary does. I’m interested in seeing how the rest of Gary’s story unfolds. We’re beginning to see his true, vulnerable self peek through the humorous deflection little by little. I just worry with the weight of Maggie’s double secrets (the fact that her cancer is back and that she has a husband) will cause his heart to harden and suffer. I am not the biggest fan of Eddie. I think the reason is obvious — most of Eddie’s personality so far has been wrapped up in his affair with Delilah. I really don’t know much about him apart from the fact that his relationship with his wife is terrible but he has an adorable son. We don’t get to know much more about Eddie in this episode, but we do get to sort of piece together some of the pieces of the affair puzzle. I mentioned in my review of the pilot that the soapy elements of A Million Little Things set this apart from This Is Us; Eddie and Delilah’s affair storyline is definitely the major factor in this. In “band of dads,” we can safely assume that Jon knew about Eddie’s affair with Delilah and that, at the end of his life, he was okay with it. (This is based on Delilah discovering that Jon found Eddie’s necklace.) Jon’s voicemail to Eddie instructing them love each other could obviously be taken to meant that the group should love each other; but Eddie knows the subliminal message there could be an instruction for Eddie to love Delilah well. Sophie and Eddie are forced to bond (kinda) in the episode when he becomes the one to take Jon’s place in the father/daughter dance competition. But Eddie isn’t as skilled a dancer as he’d like, and between the frustration of not really getting the routine and the awkwardness of dancing with a girl whose dad just died — and also the fact that Eddie was sleeping with Sophie’s mom — he eventually realizes he’s not meant to dance with Sophie after all. In flashbacks, we watch Sophie’s softball game take place and it seems to be the precursor to Eddie and Delilah’s affair, where the two set up plans for dinner without their respective spouses or kids. I don’t think Eddie is a terrible person necessarily, but I’m struggling to connect with him beyond just being Delilah’s affair partner. I hope this changes. Rome is the most interesting character in the show to me. Early in the episode, he visits Jon’s office because he can’t sleep. There, he imagines himself in Jon’s shoes — right until the moment he jumped. It’s jarring and yet also telling in terms of Rome’s mental state. Gary keeps checking up on Rome and is more than a little disappointed when the man says he hasn’t told his wife, Regina, about attempting to take his own life. Like most of us do, Rome insists he has everything figured out and he’s fine. But we know that’s further from the truth in Rome’s case than most of us. While at a commercial shoot, Rome begins to have a little bit of a breakdown (the editing of the scene captured Rome’s fried emotional state pretty well), and becomes increasingly frustrated when he can’t seem to find any footage of Jon smiling. Why? Because Rome knows that behind every smile is another story. He plastered on a smile at work, but inside he’s melting down. And he now knows that Jon did the exact same thing. So Rome goes to talk to Maggie. And although she advises him that she cannot and will not be his therapist, it seems like we might not have seen the last of these two people talk about mental health. Even though Regina doesn’t yet know about Rome’s depression and its depth, I do appreciate the fact that Rome is actively pursuing help — even if he doesn’t know quite what it looks like yet. The crux of “band of dads” is a breakdown Sophie has about how her dad provided for so many people — he left a restaurant for Regina and wrote out his will — but it seems like he left her without a dance partner. She was the only one he didn’t seem to plan for. But that’s not the truth. At the end of the episode, Rome realizes that Jon prepared him to take his place at Sophie’s dance; Rome was the one helping Jon learn the steps to begin with. As Sophie and Rome dance, they realize that Jon knew what they both needed. While the concept is lovely out of context, I do worry that the sentimentalization of suicide (the notion that Jon had a plan all along to provide for his family and friends, and that “everything happens for a reason”) is just as problematic as the message 13 Reasons Why sends (that you can still be connected to the people you love from beyond the grave if you take your own life). There are so many things about A Million Little Things that are great — the cast is stellar and the music is beautiful — but its central premise unsettles me just enough to leave me questioning what kind of messages I’m truly buying into. Okay, something is sketchy with Jon’s secretary. You all agree, right? “... Can you tear me off a tiny sheet?” “I’ll have one.” That was a super realistic scene of me whenever anything sweet and/or emotional happens, y’all. Stay tuned next week for another A Million Little Things review!